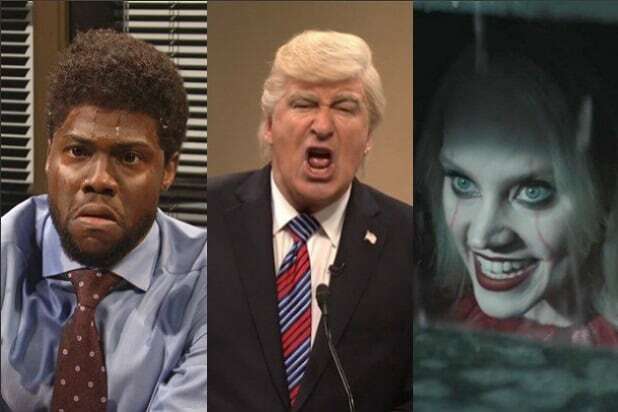 The segment kicked off with Weekend Update co-host Colin Jost noting that Thursday marked the one-year anniversary of the investigation by special counsel Robert Mueller into the Russian interference in 2016 elections. Co-host Michael Che referenced Trump’s sarcastic tweet about the investigation, in which he called Mueller’s probe “the greatest witch hunt in American history,” then joked that, actually, the witch hunt is pretty great from his point of view. You’ll find the transcript of the segment below, and you can watch it in the video embedded at that top of this post. Referencing the recent “Laurel/Yanny” meme, Jost talked about the way the Mueller investigation comes off to people who either dislike or support Trump. Che: “President Trump posted a sarcastic message on the anniversary of the Mueller probe, saying ‘Congratulations, America. We are now in the second year of the greatest witch hunt in American history.’ And you know what? It is pretty great. Personally, I like how unfair and mean-spirited it is. It’s not every day a black man can root for the feds, but I’m really enjoying this. I feel like I’m watching Rachel Dolezal get kicked out of a Starbucks. I’m for that. Che: “North Korea issued a statement condemning national security adviser John Bolton, saying they do not hide their feelings of repugnance toward him — which I get. Look at him. He looks like he still calls jazz jungle music.